We are over the moon to announce the grand opening of our latest New York City location in Park Slope, Brooklyn! 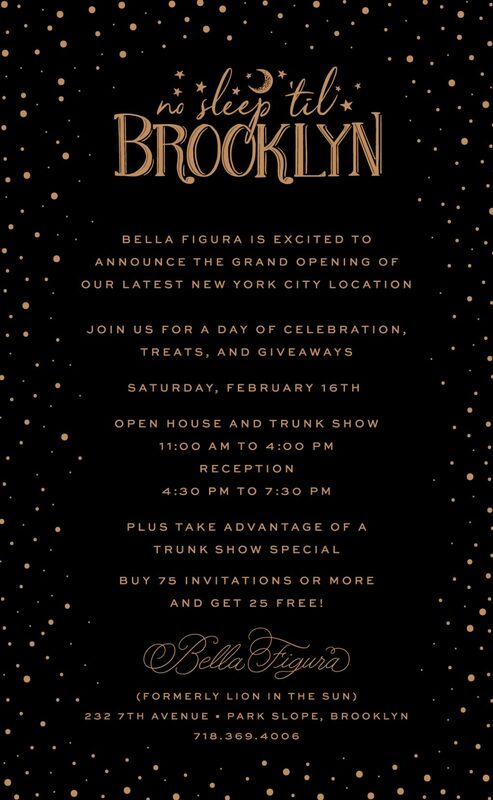 The store at 232 7th Avenue, the former Lion in the Sun stationery store, will offer our entire range of custom wedding invitations as well as one on one consultations with Bella Figura experts. We hope you will join us on Saturday, February 16th for a day filled with celebration. Our open house and trunk show will take place between 11:00 AM and 4:00 PM. Stop by and enjoy sweet treats and take advantage of our trunk show promotion. For those who place an invitation order containing 75 pieces or more, we will provide 25 complimentarily. We will also have a local photographer as well as a bridal salon displaying what they do best. A reception will follow thereafter between 4:30 PM and 7:30 PM. Calligraphy demonstrations as well as nail art will be offered at this time to pair perfectly with even more delicious treats. We look forward to seeing you there! Join us from 4:30 – 7:30 for Celebration, Entertainment, and Bubbly! Snacks and treats by Naturally Delicious. Florals by Rebecca Shepherd Floral Design. Display and discussion with Karen Wise Photography. Hand calligraphy demonstrations and personalization by tuccicursive. Nail art station by MiGak Salon.